Sake (sah-keh) is a fermented alcoholic beverage with a long history in Japanese culture. While often called ‘rice wine’ sake is actually more like beer than wine as it is made from a grain, rice, not a fruit as wine is. Sake is a fermented, but not distilled beverage, and should not be confused with shochu, another Japanese alcoholic beverage that is distilled. The alcoholic content of sake is higher than beer, generally between 12% and 18% alcohol by volume, and has a complex, even fruity flavor when made by a high quality manufacturer. Sake characteristics run the gamut from sweet to dry, fruity to earthy, with acidity and fragrance complexities that rival western wines. Sake is far from a simple drink. Historically, this beverage was served warm, and the reasons were twofold. Firstly, this ancient drink was created before refrigeration and was therefore habitually served that way after methods to chill food and drink were developed. Secondly, sake was also historically a much more coarse beverage, and often took up flavors from the wooden casks in which it was stored. Many off flavors were also a side effect of the fermentation process, which were masked by serving it at a higher temperature. More recently, better brewing techniques, more refined strains of yeast and koji, and modern storage practices have created a very different product than in the past. A more refined product does not mean that all brands or styles are the same, however. Just as western wines have subtle differences, so do sakes from different regions and different manufacturers. In general, high quality variety is meant to be consumed cold, while lower quality one is drunk warm, which can hide off flavors that are created during the fermentation process of the cheaper brands. That said, the peak flavor higher quality sakes can be achieved at subtly different temperatures, different for each brand. To most people, this difference will not be noticeable (similar to the many different kinds of tea, each of which has an ‘optimal’ brewing temperature). But a general rule is that high quality sake should be served slightly chilled, but never too cold as many of the subtleties of the beverage may be muted when the drink is too cold. There are a few decent types, however, that are meant to be served slightly warmed, and will be labeled as such, and can make a nice treat on a cold winter day, but as a general rule, higher quality sake should be served slightly chilled. Sake takes approximately one month to make and is consumed rather quickly after being aged about six months to smooth out its flavor. It will not improve with longer aging as will some traditional western wines. Rice used in the production is polished, or ‘milled,’ removing much of the outer coating. In fact, in some premium sakes, as much as 65% of the grain is milled away, leaving only a small amount of the grain to be used in production. The degree of milling will greatly influence the quality of the final product, and there are five designations for sake, depending on the degree of milling and additives in the final product. Junmai-shu: This is a ‘pure’ sake with no distilled alcohol added as a finishing ingredient. Traditionally, 30% of the grain had to be milled away for this designation, however recently the laws have changed and there are no longer any milling requirements, only that no alcohol may be added to the product. Honjozo-shu: This style has had at least 30% of the grain milled away and a modicum of alcohol has been added during finishing. Ginjo-shu: This style has had 40% of the grain milled away and may or may not have alcohol added during the finishing. If bottle is labeled Ginjo, it indicates that distilled alcohol was added and if it is labeled Junmai Ginjo, it means there was no alcohol added. Daiginjo-shu: This sake style has had 50% of the grain milled away and also may or may not have had alcohol added during finishing. If bottle is labeled Daiginjo, it indicates that distilled alcohol was added and if it is labeled Junmai Daiginjo, it means there was no alcohol added. Namazake: This is actually a special designation that means that the sake was not pasteurized before bottling. 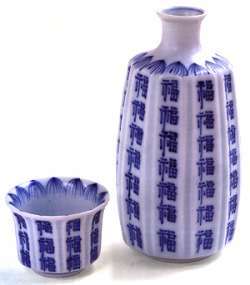 Sake is generally pasteurized to kill any bacteria or mold that may contaminate or ruin the final product in some way. It also serves to deactivate certain enzymes that may change the characteristics of the sake (for better or worse) before it reaches the consumer. Sake production is a complex undertaking. First the rice is milled, as mentioned above. It is then washed, soaked, and rinsed to remove any particulate matter (called nuka) that may be clinging to the grains. The rice is then steamed to the proper consistency for the fermentation, as the rice will be fully cooked yet still slightly firm. Half of the rice is placed into a large vat and the other half is reserved to create the starter, with a special mold called koji sprinkled into it when it has cooled. This will be used to convert the starches in the rice to sugar for fermentation. Over the course of three to four days, the koji starter is mixed and carefully watched. When ready, a portion of the the koji starter is mixed with a portion of the remaining cooked rice, and water and yeast is added. Fermentation takes place over the next few weeks as more rice, water and koji starter are mixed in over three successive stages. When the mash (as the fermenting mix is called) has reached the point of perfection (a judgment that is more art than science and generally done by very experienced individuals) the resulting product is pressed to separate the liquid from the solids. Traditionally, this was done by hand using large canvass bags, however now is mostly done by machines. The resulting liquid is then filtered and pasteurized. The sake is generally aged six months, after which it is blended and often water is added to achieve the proper level of alcohol by volume. It is then bottled. Some sake is actually not filtered and contains some of the lees (sediment) and is called nigori-zake (cloudy sake) usually labeled as pearl in western countries. Sake may sound like a simple product, rice, water and yeast, however the slightest change to the process can make a world of difference. The source of the rice is crucial to the consistency of the product. And variation in the koji production, or the temperature of the fermentation can also result in a drastically different profile. The process of making this delectable beverage is truly an art that has evolved over the centuries, and continues to progress even today. Just as varietal wines from different regions and grape types can display vastly different characteristics, so can sake from different regions and manufacturers. It is well worth the effort of anyone who likes sake to explore the many different sakes available.